Many thanks to my friend Charlene Dunlap for this article about her movie work with Poodles! 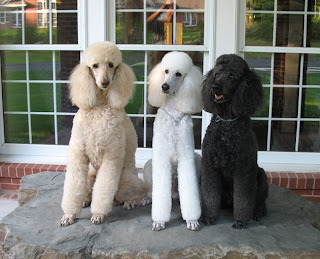 My Standard Poodles are veteran movie actors having starred in numerous movies that my husband and I produce. We recently finished videoing Act 1 (of a three-act story) of Jyah and Sydney’s first mystery. At Jyah’s detective agency on his office desk, there is a Newton’s Cradle. I trained Sydney (who plays a Dr. Watson type to Jyah’s mysterious “J.D.” character) to use the device. Newton’s Cradle Multi-Ball Pendulum (named for Sir Isaac Newton (1643-1727) is a classic desktop executive toy that demonstrates Newton’s principal: “For every action, there is an equal and opposite reaction.” The device consists of a series of identically sized metal balls suspended in a metal frame so that they are just touching each other at rest. Each ball is attached to the frame by two wires of equal length angled away from each other. This restricts the pendulum’s movements at the same place. If one ball is pulled away and is let fall, it strikes the next ball in the series and comes to a dead stop. The ball on the opposite side of the series acquires the momentum of the first ball almost instantly and swings in an arc that one would expect of the first ball. The intermediate balls appear stationary. What actually happens is that the first impact produces a shock wave that propagates through the intermediate balls. This continues until, toward the end of oscillation, even the intermediate balls jiggle a bit and they all come slowly to a stop. In the scene, Sydney goes to the desk, picks up and pulls the first ball, and then lets it drop, starting the momentum. For her to understand how to correctly use this device, there were nuances she needed to be aware of: 1) pick up and pull only the outside ball - which isn’t easy because each ball is the size of a marble and lies against its neighbor, 2) pull the ball back without displacing the cradle itself, and 3) let the ball go so that it hits the next ball with the correct amount of force. The degrees of distinction in accomplishing this are rather complex for a dog to understand. So, how did I teach it? Some things seem to take forever to train, and I thought this might be one of them . . . even though Sydney is very good with "front teeth" behaviors -- holding a pencil to type on a keyboard or to dial a phone, picking up quarters to put in a small-mouthed jar, etc. The behavior turned out to be one of the easiest I have trained. Why? 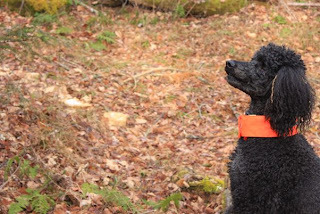 Since puppyhood, my Poodles have been taught to use learned behaviors in different contexts. I simply called Sydney over to the desk, showed her how the toy worked, and then held out the first ball asking her to “take it.” When she did, I clicked (with a reinforcement clicker device) and she dropped the ball. (The click ends the behavior.) Next, I asked her to “get it” (the first ball) . . . which wasn’t simple because her nose didn’t fit easily into the cradle without getting tangled in the wires. It took only three tries for her to understand the concept of what was expected, and she could do it perfectly every time. Newton himself would have been proud of this Poodle!! Show Ring type of Recall, dog comes "front". In the show ring, the dogs sit quietly, totally intent on watching their owner, then fly toward them when they hear the command “come” or “here.“ They then sit beautifully straight in front of their owners, and even swing around to heel position when asked to do so. These perfect “recalls” rarely exist in real life, even when a show dog is called outside of the show ring. Why? First of all, the conditions are rarely the same. When we are calling our dogs to come, in the real world, they are usually busy doing something else, not sitting, waiting patiently for our command. How can we improve our dogs compliance to this most important of requests? First, consider what the word “come” now means to your dog. Have you called him to you when you are going to do something unpleasant to him, such as clean his ears or poke a pill down his throat? We have all done this, but unfortunately, this is one reason that some dogs hesitate before coming when called, and sometimes will not come at all. The number one rule is…your “come command” should always mean something wonderful is about to happen. If your dog has already decided that coming is optional, why not change the word you use? The word “here” is a very good one, and most of us cannot say this word without a cheerful tone to our voice. Yikes! Amazing is rotating Poodle items automatically for me, but they seem stuck on costumes (and I don't even like Halloween)! 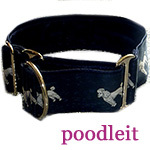 However on my Knowing Dogs Amazon store, there are many hand selected Poodle items that you will love! 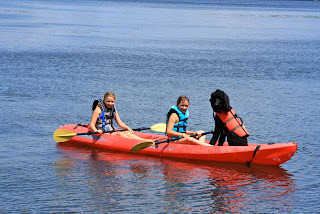 Maybe not anything as fun as Poodles in canoes, but close! Thanks to Chris L'Abbe for this photo. More of Chris' photos can be found on my dog training blog, http://www.knowingdogsblog.com/. This is Cephira, owned by Bruce Swift. Isn't she gorgeous? Bruce says even though she is the youngest of his Poodle crew, she is the most fearless, never meets a stranger, loves to play fetch, and is outgoing and stunning in the show ring. Bruce mentioned that Cephira has recently been put in the Continental trim for her adult show career--hopefully he will keep us updated on Cephira and will share more photos in the future! 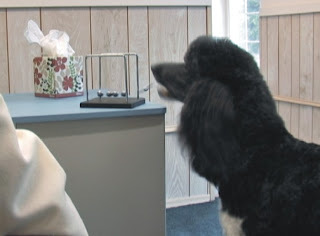 I recently met Bruce and Cephira on Sherri Regalbuto's The Standard Poodle Facebook site. It is a great place to meet other Poodle people. Hope to see you there! Isn't this a lovely trio? 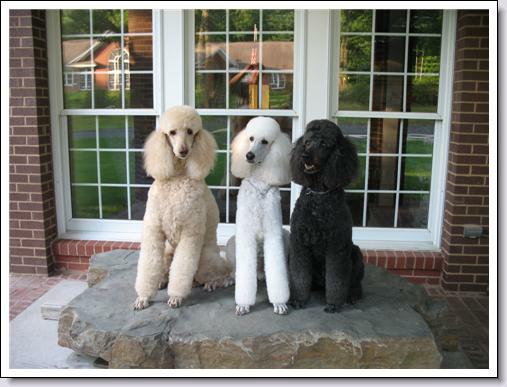 These are three dogs that have been owned and loved by Donna Trebert (Teddy, Tyler and Mickey). I became acquainted with Donna through a Poodle e-mail list, and have gotten to know her better because she has been incredibly kind to share photos of her gorgeous Poodles for my Poodle blog site. 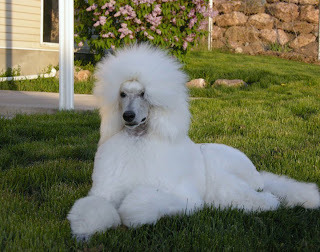 Donna has, unfortunately, experienced first-hand many of the health problems we have in Standard Poodles. I have asked her to share some of her experiences for our readers. We can talk all day about health issues in our breed, but personally experiencing life threatening illnesses with your own beloved dogs is what makes one realize how critical it is that Poodle breeders get serious about health clearances, and working together to outcross to produce healthier dogs. Many people who have loved a Poodle and experienced the health issues will never choose to have another Poodle. Donna is not one of these people...she is very dedicated to this breed and the dogs she has loved, despite the health issues. Click "read more" to read my interview with Donna and see more photos of her beautiful dogs. Years ago, when I first started training dogs, food treats were absolutely forbidden in obedience classes. Many of us used treats at home while working with our dog on certain exercises, but we were not allowed to use them at class. I admit though, some of us had treats in our pockets , a little bit of cheating in class to keep our dog’s attention! The tide changed, and in the 1980s, “positive reinforcement” became the buzzword, and the motivator of choice became food treats. This had both good and bad consequences. Good in that dogs who love treats became very easy to motivate with cookies, but bad in that many dogs ended up working only for cookies. In this article, I’d like to give you some hints on how to use training treats effectively, as well as when to choose not to give your dog a food reward. These tips apply to training companion dogs and many competition dogs, but please note that food is used differently to “bait” a conformation show dog in the ring and may also be used differently for training dogs for other disciplines.